Participants from the Shoalhaven region in New South Wales have committed their stories, bodies and feelings for the land to collaborate with two artists to create on screen fantastical visions of their reality. Hyperreal Tales emerged from a Bundanon artist residency in 2011 when Philip Channells ran dance workshops for the Shoalhaven community. The Bundanon Trust’s desire to connect with local health services opened up an opportunity to work with disability service providers. For three years, director-choreographer Channells and filmmaker Sam James have worked with 19 story tellers and artists to create a five-screen video installation featuring 12 interconnected stories and performances realised in natural and virtual settings. 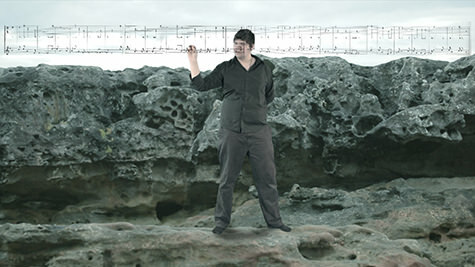 In this video, courtesy of the Bundanon Trust, Philip Channells describes the evolution of this ambitious collaborative work and participants appear in excerpts from Sam James’ video creations.